A Star Wars lightsabre, bird feeder and an aerobics video are some of the unusual items Brisbane residents have left on buses and in parks this year. Brisbane City Council officers are no strangers to googling the value of a bottle of wine or calling around to businesses when trying to reunite an item with its rightful owner. “We’re kind of like detectives in the lost property office,” council customer services manager Shane Hackett said. Other items recently left on council buses include new children's toys, perfume, a floor polisher, golf clubs and a suitcase full of shopping. 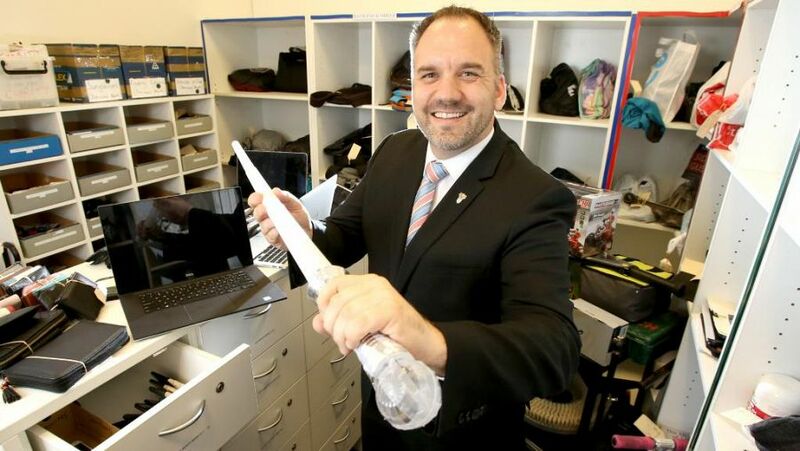 Council will categorise lost property items, with some falling into the not-valuable and under-$10 category, including things such as plastic water bottles or pencils, and these are thrown out straight away. The next category, semi-valuable, is for items worth between $10 and $100 and they are kept for one month. “If it’s a bottle of wine, we will jump onto the Dan Murphy's website and try and estimate how much that bottle is worth as some bottles of wine could be worth thousands of dollars,” Mr Hackett said. Anything valued over $100 or that might have sentimental value is kept for two months. Mr Hackett said 80 per cent of lost property came from buses and bus stops and stations and the remainder was from parks and public areas. Anything considered suspicious, dangerous or criminal is handed straight to the police. Mr Hackett said any dangerous items were usually found in parks and council officers had previously come across a replica firearm and drugs. “The asset services team, if they find that in the park they don’t even send those dangerous items to us, they just forward them straight to the police,” he said. In 2015 the council did a review of its lost property system as its storage area was overflowing and the council was facing costs of about $250,000 a year to lease a new space for all the items. Mr Hackett said this prospect prompted the council to implement the structured system and also place stickers on buses reminding residents not to leave items such as umbrellas and wallets. “It resulted in a 31 per cent reduction in umbrellas straight away ... we also had 12 per cent in other items left on buses,” he said. Mr Hackett said the reduction in lost items following the installation of the stickers, which cost $835 to print, saved the council more than $100,000 a year in storage. Items that have been stored beyond the allocated time are donated to charities, including the council tip shop, Project Homeless Connect, Lions and Lifeline.